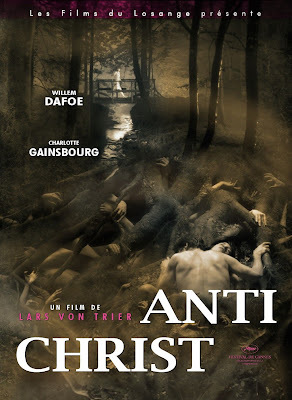 Resonance ...: Antichrist (2009) - Incomprehensible !!! This is not at all a review !!! No one can review this Lars von Trier film, as the film would, I am sure, convey different things to different viewers in succeeding viewings. - Intensely horrific - the film stars only two characters (yes .. Absolute two), the fear or horror evoked is based only on the fear of being lonely or solitary. As far as I am concerned, it was genuinely horrific and definitely not a B-Grade exploitation. The viewer would naturally transcend himself/herself into the shoes of the protagonist and hence will feel engulfed with the fear of being lonely, under the circumstances portrayed. - Very less dialogues - The film almost conveys everything via images and brilliant cinematography. Cinematography & the powerful imagery is the acute strength of the film and it almost single handedly carries the film forward. It was a real treat to get lost into those vivid images and I am sure the film's camera work would require a thesis-long analysis to comprehend the techniques and mastery exhibited. - The film will evoke a lot of confusion and chaos in the minds of a viewer, atleast in the first viewing. Many shots and still images - I am sorry, I haven't comprehended them yet. Probably, a copy with the director's commentary audio track would help. - Like Tarantino flicks, The film's narration carries a chapter structure. But the focus is linear and no flashbacks, no other characters - Lucky that way... Or else, it would have mounted even more incomprehensibility in the viewer. - The film has in it, a lot of grossly violent sequences and really disturbing images. They just add up the confusion and more importantly, since the grossness is concerned with male and female genitalia also, I don't know .. If the film is suitable for all categories of audience (among adults only). - Without spoilers here, the film, I guess, should be about the evil-ness that rests 'within' one's self, here in this case, within a female. By looking at the controversial critics the film has managed to receive, I guess again, the film is trying to question a few Biblical stuff. Due to non-acquaintance with Christianity or the Bible, I have no comments on that front, actually. - Google out the meanings of the terms "Misogyny" and "Gynocide" before starting with the movie, if you aren't already aware of them. The film, quite heavily discusses them. - It's quite unable to classify the film's genre ... IMDB calls it Drama & Horror. The film has a lot of surrealistic elements, helped accordingly by the camera. - The film premiered at the Cannes 2009 and was nominated for the Palme d'Or and the film's ladylead Charlotte Gainsbourg won the Best Actress honour for her fine performance. - The film, with some of it's gore and sexually violent images, will haunt you and it's very easy to call it bad or uninteresting on those grounds. But, on an under-layer, it has quite a lot of artistic or auteuristic nuances that are all open for your imagination, interpretation and appreciation. The film, I am sure, will be hailed as a classic and would attain a cult status in future. - Not for all, definitely and not a must-watch also .. It has something very very different to offer ... You have the inclination ?? Start with it and no disappointments, I guarantee. Black and white imagery - It has its beauty always !